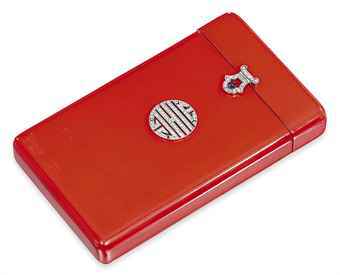 Art Deco Lacquered Cigarette Box with Diamond-Set Findings. Lacquer is a spirit based varnish used to coat metal or wood and to protect finishes. With the addition of iron oxides or coloring agents, it can be quite vivid. The ancient Chinese were quite proficient at the process and a tradition of lacquerware existed in China for centuries. The techniques developed in China spread across Asia to Korea, Myanmar, India, and other countries. A separate tradition of lacquerware developed in Japan. Chinese laborers experienced in the use of lacquer were imported to lacquer airplane propellers during the war. Following the war, they were conscripted by the jewelry industry to polish and lacquer jewelry.